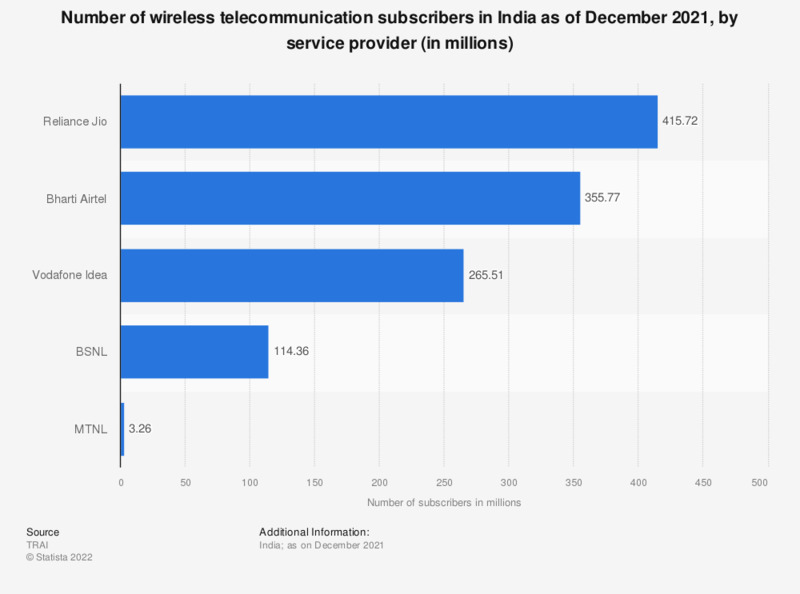 This statistic shows the number of mobile wireless telecom subscribers in India as of December 2017, broken down by company. The leading company at this time was Bharti with about 290 million subscribers in total. As of December 2016, there were over 1.1 billion mobile wireless subscribers in India. Some of the biggest mobile telecom companies in India include Bharti, Vodafone, and Idea, who have over 600 million Indian subscribers combined. Bharti is the overall market leader in the wireless subscriber market with a 23.65 percent share. In comparison, Vodafone has an 17.86 percent share and Idea has a 16.54 percent share. BSNL, the market leader in the Indian wireline segment, has just a 8.78 percent share in the wireless subscriber market. Bharti Airtel Limited is headquartered in New Delhi and operates in 20 countries across South Asia, Africa, and the Channel Islands. It is the world’s third largest mobile telecommunications company, with over 275 million subscribers. As well as being the market leader for mobile telecoms in India, it also has the most wireless subscribers in the country with some 23 million customers as of July 2014. Vodafone, Bharti’s closest rival, had 18.64 million customers in the same month. Vodafone is the second largest mobile telecom provider in India with over 212 million subscribers as of June 2017. It is also the world’s second largest mobile telecommunications company measured by both subscribers and 2013 revenues, and had over 434 million global subscribers in March 2014. India is by far Vodafone’s biggest market in terms of subscribers with over 100 million more subscribers in the country than in its second largest market, South Africa, which has 65 million subscribers. As a result, almost 18 percent of Vodafone employees were located in India in 2013, in comparison to the 16 percent who work in the United Kingdom, where the company is headquartered. In 2014, the company announced worldwide revenue of over 38 billion pounds.